There is much to consider when buying a new roof for your home. You will want to protect all that your home contains, and protect your investment. Here are 3 important things to consider when making your roofing purchase decision. If you live in an area prone to wildfires, fire resistance can be an important thing for you to want in a new roof. Think in terms not only of initial fire resistance but also fire resistance after the product has weathered for a few years. Products that dry out over time will be increasingly less fire resistant with age. Also, in the event of an interior fire, low weight roofing can help protect your home while allowing firefighters to enter the structure and extinguish the fire at the source. About 60% of the visible exterior of most homes is the roof. Today’s roofing options offer a wide variety of looks, styles, and colors. Kassel & Irons even offers the option of custom-colored roofs. Choosing the right product can enhance your home, adding curb appeal and value. Visualizer tools can help you in advance to compare what different roof styles and colors would look like on your home. The amount of value added to a home by a new roof depends largely on the aesthetics of that roof, and the ability of that product to maintain its beauty even as it ages. Do You Want to Learn More About Buying a New Roof? Check out the other articles on this subject. 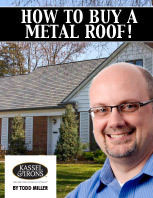 Our free How to Buy a Metal Roof can help you determine what type of roof is best for your home.